Hi-rise hanger size markers are a wise and cost-effective way for retailers to show customers where their size is on the sales floor. Not only do size markers help keep merchandise organized, but they make merchandise accessible when customers can easy spot the size they need. Our size "XXXXL" marker slips over standard metal hanger hooks so that your customer can see the size on each garment. Our markers feature a 1/2 diameter round plastic white piece with a black number(s) located in three places around the marker to indicate that the garments size. 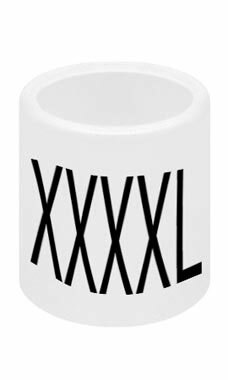 These size XXXXL markers are sold with 50 markers per bag at low prices.